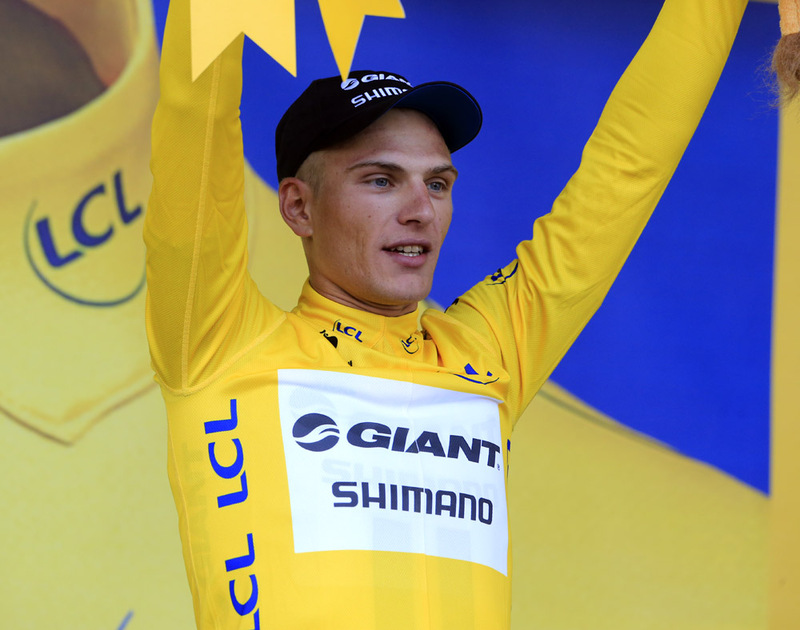 Marcel Kittel (Giant-Shimano) underlined his status as the sprinter to beat with a victory in the opening stage of the 2014 Tour de France in Yorkshire on Saturday. 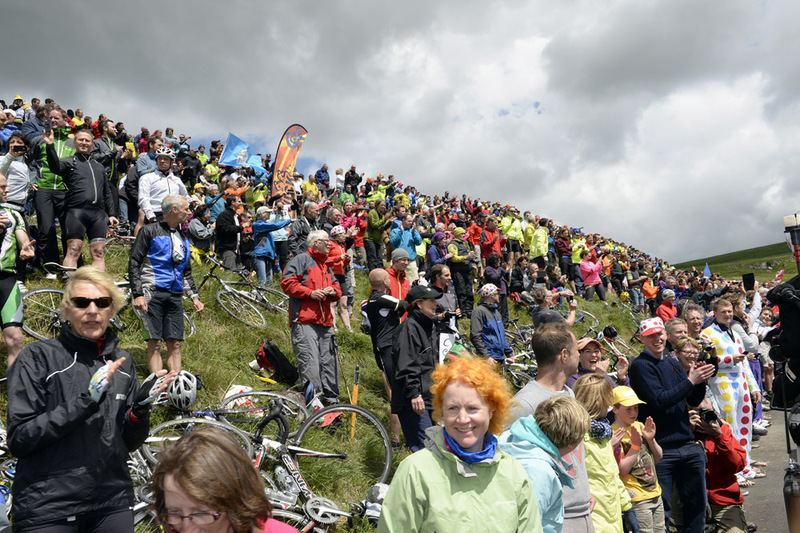 In spite of the climbs and the crosswinds, the opening stage of the Tour between Leeds and Harrogate was always pencilled in as a sprint finish which would see a resume of the sprint battles of the 2013 Tour de France. The script, written by supporters of Mark Cavendish (Omega Pharma-QuickStep), would see the Manxman put young German upstart Marcel Kittel (Giant-Shimano) in his place, enabling Cav to claim the first yellow jersey of the race. Alas, that’s not the way it panned out, with Kittel storming across the line ahead of Peter Sagan (Cannondale) and Garmin’s David-Millar-replacement Ramunas Navardauskas while Cavendish lay in the road clutching his right shoulder in an approximation of a rider with a broken collarbone. In the hurly-burly of the sprint, Cavendish leaned shoulder and head into Simon Gerrans (Orica-GreenEdge) and brought them both down, with the Manxman appearing to come off worst. On first viewing it looked a lot like the move that had seen Cavendish’s lead-out man Mark Renshaw thrown off the 2010 Tour de France, but nobody was shouting about that too loudly as it appeared Cavendish was out of the race anyway. It was a controversial end to a stage which more than lived up to expectations, with fans favourite Jen Voigt (Trek Factory Racing) attacking as soon as the 13km neutralised zone came to an end, taking Cofidis’ Nicolas Edet and Bretagne Seche rider Benoit Jarrier with him. In spite of the gusting winds and narrow roads, the peloton never let the trio get far and when Voigt attacked his breakaway companions, there was no way the Trek rider was going to stay clear. It was noticeable that Omega Pharma, Cannondale and Lotto all committed a rider to the front of the bunch with over 100km to go – a sure sign that the sprinters teams had all had a word with each other to ensure that (a) the break wouldn’t get 20 minutes and (b) the teams were happy to cooperate straight away rather than play poker to see which team was going to take responsibility for the chase. The break was doomed. Voigt attacked before the Buttertubs climb and made his way through huge crowds as the peloton split behind, at one point Joaquim Rodriguez (Katusha), Chris Horner (Lampre) and Thibaut Pinot (FDJ.fr) were both off the back, caught out by the gradient and the sidewinds. Voigt stayed clear on the final climb of the day at Grinton Moor, but he was caught shortly after, having scored enough points to take the mountains jersey. With crowds spilling all over the road, a weird calm seemed to take over the bunch and, with 65km to go, it looked like an amnesty was called, allowing the bunch to reform and the predicted sprint to take place. As is so often the case in the early sprint stages of the Tour, there was a crash inside the final four hundred metres, the precise cause of which will be debated for months to come. Ask a Cavendish fan and they’ll say it was a racing incident. Ask an Aussie and they’ll say that Cav was out of control and that, after all, he’s got previous convictions for his… conviction. What is not in dispute is that Cavendish became entangled with Gerrans and caused a crash which had an impact on the outcome of the sprint. Which is not to say that Kittel would not have won. merely that the other placings may have been different. Sunday’s second stage from York to Sheffield features no less than nine categorised climbs in a leg-breaking route over 201 kilometres.